Plan what you are going to do in Salzburg after reading our recommendations on the city's attractions, sightseeing, dining, shopping and excursion options. Salzburg is one of the most popular tourist destinations in Austria. Close to the Alps, this city gets busy throughout the year. Salzburg’s Old Town is brimming with baroque architecture and has been a UNESCO World Heritage Site since 1997. The city is home to three universities, but is most famous as the birthplace of Wolfgang Amadeus Mozart, a musical genius. Set on the banks of the Salzach River, the city is brimming with history and culture. There is a bustling nightlife and a busy business district. This is the fourth largest city in Austria and has a large number of students, due to the top universities being located here. The great thing about Salzburg is it appears to be untouched by modern day. As the Alps loom in the background, the area is filled with magnificent lakes and natural beauty that will take your breath away. Salzburg has become a top choice when it comes to technology and science and has this has become a booming industry in the area. The opportunity to visit a city which hasn’t become modern in terms of architecture is a delight, you can see the city as it was years ago. 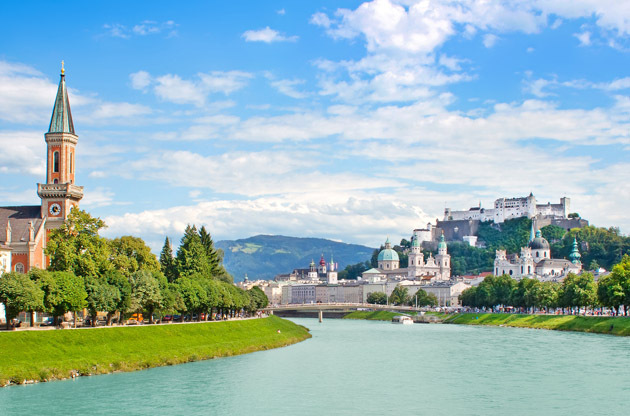 Anyone interested in architecture will love visiting Salzburg, especially the Old Town, which is home to some of the most impressive baroque architecture in the world. Salzburg is located in central Austria, close to the German border. This city can be found in the Northern Alps region of the country. Salzburg Airport is ideally located only four kilometers from the city center. There is no train service, but it has a reliable and regular public bus service which runs every ten to twenty minutes. There are always plenty of taxis outside the airport that can take you straight to your hotel door. With such a short distance between the airport and city center, it’s affordable to take a taxi in Salzburg. Salzburg is a city rich in history and culture and there are no shortage of spectacular sights and attractions to explore while in the city. The Hohensalzburg Castle is an absolute must when visiting the area. This is a visible landmark set on top of Festungberg Mountain. The castle dates back to 1077 and is open daily. It’s definitely worth exploring if you have the time. Mozarts Birthplace is a popular museum set over three floors. This museum enables you to learn more about this famous composer, his life in Salzburg and where he lived. You can see his childhood violin, visit the room where he came into this world and so much more. The great thing about this museum is that it lets you not only step into Mozarts home, but also step back in time and see what it was like to live here all those years ago. Mirabellgarten Palace and Gardens is an attraction that shouldn’t be crossed off your itinerary. The palace dates back to 1606 and the gardens to 1690. There is the hedge theater and dwarf garden to explore as you make your way around this spectacular property which is open daily to the public. Salzburg is home to some of the most amazing shopping centers, but also has a large number of boutique shops to explore. Getreidgasse and Judengasse are popular shopping streets in the Old Town center lined with a choice of interesting and unique boutique shops. If it’s a shopping center you’re looking for, then head to Forum 1. This is a modern shopping center and home to fifty shops selling a variety of items. The popular shopping center is Kiesel Shopping Center. While there are only twenty shops, they sell everything from clothing to fresh produce. This center is set over two floors and is a great opportunity to enjoy some retail therapy while in the city. Salzburg has a number of gourmet restaurants to choose from. Being in Austria, you may want to try some of the traditional foods which is why Gasthaus Wilder Mann is such a popular choice with both the locals and tourists. This restaurant offers traditional cuisine, the staff are dressed in traditional clothing and there is lots of beer to accompany the hearty meals. They also have outdoor tables spilling onto the cobbled street outside for those warmer evenings. Being a university town there are a choice of relaxing bars and nightclubs in Salzburg. Shamrock Irish Pub is a very popular choice with everyone in the area, a fun and welcoming atmosphere and a place where you can enjoy a relaxing drink before returning to your hotel. Chez Roland is a cocktail bar that is also a main music destination in the city and a must if you are looking for a fun night out on the town. Salzburg isn’t only known for being the birthplace of Mozart, it is also where the famous film the “Sound of Music” was filmed. One of the most popular day tours is a four hour Sound of Music tour which takes you through the rolling hills where the film was made, you get to visit Mirabell Gardens and Leopoldskron Castle. Hallstatt is a bus ride from Salzburg. It takes about two and a half hours to get there, but once you arrive you find yourself in a beautiful Alpine village which is rich in history. You can wander through the village streets, visit the market square and chapel before heading back to Salzburg. The ice caves are a big tourist attraction and there is a five hour day tour which will take your through the Werten Village to Eisriesenwelt, the biggest ice cave in the world. Many international congresses, conferences, symposiums, trade shows, fairs and exhibitions take place throughout the year in this beautiful Austrian city. The attendees get the chance to take part in their and event and enjoy what Salzburg offers them at the same time. The good quality and accessible venues and the expertise of the organizers guarantee the attendees' expectations are met.